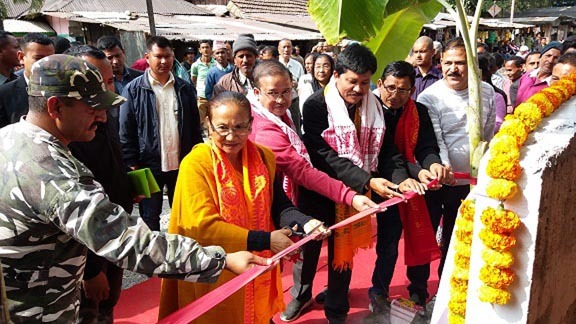 Assam’s Social Welfare and Soil Conservation minister Pramila Rani Brahma on Tuesday laid the foundation stones for a model village and India Gate at Saralpara in Kokrajhar district. Both the projects of model village roads and India Gate will be implemented at a cost of Rs. 8.52 crore and Rs. 2.22 crore respectively under Border Area Development programme (SCS) for 2017-18 and 2018-19 respectively. During the programme, the minister said taking initiative for transforming Saralpara into a model village was her first choice as the people of this area have been facing many problems for potable drinking water, higher education, health care facilities, housing, etc. in their daily life. “But with the implementation of the project, now it would become easier to construct health centres, roads, school buildings, play ground, bring in electricity, create drinking water facilities, tourist spots, build toilets, etc., as it will help in implementing various developmental schemes of the government in this particular village,” minister Brahma added. Brahma hoped that the India Gate, which will be constructed near the Indo-Bhutan border at Naharani area, Saralpara will be able to attract tourists and help in regulating trade in both the countries. The programme was attended by Bhaskar Das, additional deputy commissioner of Kokrajhar, Jagamahan Basumatary, additional chief engineer and council head of department, PWD, BTC, Rajesh Kr. Singh, assistant commandant, SSB, Saralpara and other dignitaries.